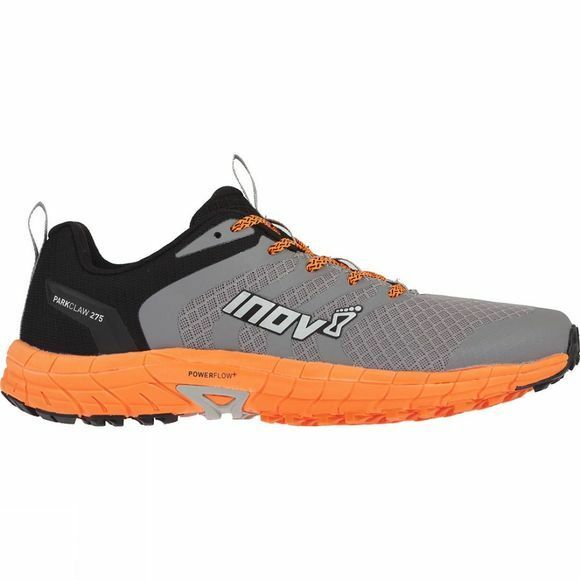 The PARKCLAW™ 275 is the perfect shoe for runners wanting to run on paths and trails, or those looking to make a transition from road running to trail running. It performs superbly on both terrains, and features an aggressive outsole for increased grip. For running on paths and trails. Ultra smooth and cushioned ride: Run effortlessly over any road conditions with new Powerflow+ midsole technology. Powerflow+ delivers 10% better shock absorption and 25% better energy return than standard midsoles. Versatile grip: Slightly more aggressive, trail-style stud pattern compared to a road specific shoe but the design of the studs ensures it feels smooth when running on roads. Get more support: External Heel Counter wraps around the rear of the shoe and provides support in the heel. Delivering this extra hold aids foot stability and helps a fatigued runner maintain a better gait. Increased durability: Features more protective, durable upper materials better suited to handling trail debris and environments.